Mixed-use developments are rising all over Los Angeles, particularly in Hollywood and West Hollywood. Some buildings look better than others, though sadly none show the classic architectural spark that once existed in the early 20th century. Nevertheless, most new projects aim for common goals: sustainability and improved pedestrian infrastructure. But not all mixed-use projects follow guidelines on creating pedestrian environment. Some developers continue constructing 1980’s-style automobile-oriented buildings, without adequate streetscape or aesthetics. A classical example of an anti-pedestrian development is The Avenue Hollywood, located in the heart of Hollywood, on La Brea Avenue just south of Hollywood Blvd. 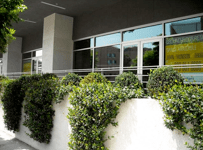 From a distance, we see an attractive, modern midrise building, designed with good contemporary standards. 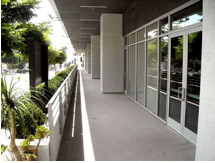 And unlike most other low-to-midrise buildings, The Avenue Hollywood building is based on concrete and steel – not wood. Therefore the building is much more durable and offers better fireproofing and soundproofing. The new complex certainly enhances the appearance of otherwise dull La Brea Avenue. But then one starts to wonder, why don’t you ever see pedestrians near the new development? Likewise, why is every single ground retail space still empty, with distinct “For Lease” signs? Let’s find out what went wrong with The Avenue Hollywood, and why hasn’t a single ground-level space been occupied by any type of vendor. 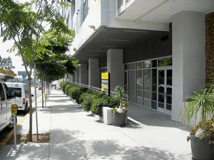 The Avenue Hollywood offers a half-dozen spaces for ground-floor retail, and 5-6 levels of apartment renting. 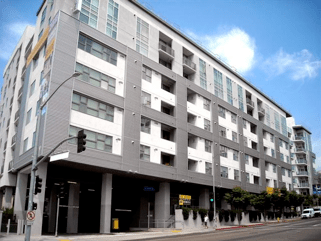 Location is very convenient: just next to the famous Hollywood Walk-of-Fame, Hollywood & Highland shopping mega-center, and a popular Red line subway station. 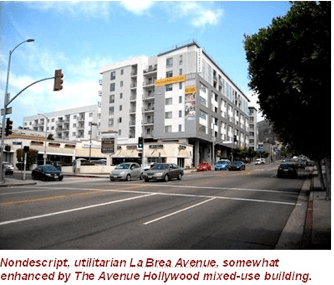 Thus The Avenue Hollywood sits on a perfect transit-oriented development location. But once you approach the complex, first good impressions dissipate. A grim reality of concrete & cement starts to unveil. Lack of pedestrian activity or amenities makes you want to walk away. The building surroundings indeed are cold and unwelcoming. Let’s take a closer look at the building. First thing that immediately ruins street-level aesthetics is a humongous parking garage entrance, a significant eyesore. Placing a garage entrance – especially with intrusive concrete columns – on a main street is big mistake. Streetscape is ruined, and pedestrians feel intimidated as the automobile takes precedence. The garage entrance should be located on a side street or alley. Next, a dominating “gray concrete” color and texture becomes overwhelming. Concrete is unattractive enough, yet no other colors – besides white – were added to enhance the building’s dim tones. And the building overall, especially the parking entrance, offers no architectural elements, as we learn from a close-up view. Time to go to the main entrance. Attractive double glass doors look clean, modern, and indeed welcoming. We see planters and a convenient walkway. Perhaps a decorative bench could improve the aesthetics even more. But overall, this is quite a nice-looking entrance! Moving onto the sidewalk, we see an area that developers truly neglected. You see just a primitive, naked concrete sidewalk. Only a few trees were planted, giving little-to-no buffer zone, failing to provide a pleasant walkable environment. Much more could be done to create better landscaping and a pedestrian, family-oriented area at the new complex. By the way, currently the City of West Hollywood is overhauling La Brea Avenue – between Fountain and Willoughby – set to dramatically improve streetscape on La Brea. Perhaps The Avenue Hollywood developers could take note, and implement similar features at their building. Now, let’s find out what went wrong with retail spaces. We see a patio leading to those empty spaces. Just as sidewalks, this retail area is also quite primitive, with naked, uncoated support columns. Overall, dim gray tones and no aesthetics or architecture. No amenities – or even sufficient space – to attract outdoor dining or to create a family-friendly environment. Also, this “ground-level” retail area is not really at ground level; those spaces are half-story higher, accessible only from the side. Not a single direct entry (e.g. a stairway) from the sidewalk. All in all, this retail area is inconvenient, cumbersome, unattractive, and anti-pedestrian. This is a classical example of “Penny-wise, pound-foolish” issue. True, the developers seemingly saved quite a bit by building the retail area cheap & fast. But with limited access and primitive settings. As a result, those spaces still remain empty. Moving further down the sidewalk, along La Brea Avenue. The whole appearance continues to look dull, gray, and nondescript. Sidewalk is narrow, but is also empty and unappealing to pedestrians. All in all, this area is quite primitive, which is sad – given the size and a great potential of The Avenue Hollywood complex. Here is another look at empty retail spaces, separated by a thick layer of concrete wall. Even though the wall has been enhanced by greenery, it still does not improve access for pedestrians onto the “grade-separated” retail area. One must wonder, why has the developer made the building surroundings so unappealing, and the retail space so inaccessible from the street level? 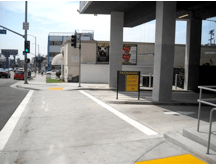 This is another view of an empty sidewalk on La Brea, facing north. The developer has the same issue: plain utilitarian concrete, with no pedestrian amenities (buffer zone, decorative streetlights, benches, pedestrian-friendly pavement, etc.). There are barely any trees. And on the left we see that same concrete barrier, aka “The Berlin Wall”. No wonder, pedestrians would feel uncomfortable walking in such an environment. A close-up of that parking lot entrance – from La Brea Ave. – into the complex. If an empty sidewalk isn’t bad enough, this huge parking lot entrance is even worse, putting any potential pedestrians at risk. But even with a parking entrance from La Brea, the developer could have enhanced this dangerous area in many ways. A safer and more visible crosswalk could have been built (including “Zebra” crossing); coating around those ugly concrete support columns could have been placed, etc. But with car-only mentality the developer obviously did not take any pedestrian factors into account. As a result, we see this southern end of the building resembling a freeway underpass! Next, we head further towards Sunset Blvd – just south of The Avenue Hollywood development. Even though this segment is not a part of the new complex, it’s still worth mentioning. 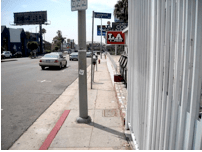 By looking at this almost non-existing narrow sidewalk, we now start appreciating sidewalks at The Avenue Hollywood! Indeed, “Cognition comes through comparison”. Hopefully City of L.A. will transform this outdated, stuck in the 1960’s, curb into a pedestrian-friendly sidewalk with landscaping. Again, this is only walking distance from Hollywood Blvd, a famous tourist attraction. Such pieces of barely present sidewalks are a true embarrassment. CONCLUSION: The Avenue Hollywood was originally designed to be a transit-oriented, pedestrian-friendly development, but has turned-out to be anti-pedestrian. Again, from a distance the building itself looks decent, but the surrounding area seriously lacks streetscape, as well as basic pedestrian amenities, overall looking quite primitive. The developers should also consider rebuilding their whole retail area and access to it, as currently it is in a very awkward position and lacks access from the sidewalk. Hopefully other developers will learn from the mistakes of The Avenue Hollywood project, and will avoid using those methods that make the area anti-pedestrian and utilitarian. We now live in a new era where urban density is replacing suburban sprawl, walkable environments are replacing car-crazed corridors, and where smart growth provides a more sustainable, healthy, pedestrian-oriented lifestyle. Cities like San Diego, San Francisco, Portland, and Seattle were able to successfully rebuild blighted areas, and turn them into sustainable, pedestrian-friendly regions. So can we! I don’t understand these split-level “sidewalks” in front of retail areas. It makes the sidewalk feel like a freeway, with one side being “express lanes” for people walking through, and one being “local lanes” for the “exits” into the shops. Except of course, sidewalks don’t need that sort of segregation, and it gets in the way of people just strolling and suddenly changing their mind and deciding to stop in somewhere. Great analysis of a shameful missed opportunity. The retail space situation reminds me of the Staples at the bottom of the Summit at 6th and New Hampshire, except they went the extra step and decided to have no door facing the sidewalk, requiring pedestrians to walk around through the parking lot. Good analysis. If you do another one of these posts, I nominate ANY of G.H. Palmer’s developments. Take your pick: the Orsini, the Medeci, the Lorenzo, the Da Vinci…any of them. All of them are missed opportunities, and all with vacant retail spaces that illustrate Palmer’s lack of foresight and disdain for the pedestrian’s experience. I think the vacant spaces are intentional. They don’t want their poor neighbors around. That’s why they look like fortresses of wealth. I think they’re trying to create a defensible space. Fort mentality going on. Likewise, why is every single ground retail space still empty, with distinct “For Lease” signs? Two thoughts: (1) there’s no shortage of available retail space and the cheaper, older spaces will rent first; (2) the developer didn’t really want to put in any retail and just did it to appease planners. As of 2/2011 (Google Street View) there was vacant space in a strip mall right across the street. If you look at vacancy rates and prices, the real demand in LA right now is for residential space. Outside of a few particular areas (e.g. Third Street in SM) the demand for retail space is pretty weak. I agree with most of your comments regarding the design of the space, including what Kenny Easwaran called “split level sidewalks”. I’ll throw out two possibilities here… first, in terms of design and construction, it’s much easier to build a floor all at the same elevation, rather than staggering it to match the street elevation. So on a site with considerable grade changes, you end up with part of the “ground floor” noticeably above or below the street grade. Since this obviously detracts from the desirability of the retail space, that might lend support to the idea that they didn’t really want to build retail space. Second – and this is really speculation, I hope someone who knows ADA better than me will respond – I’m not sure you can build additional staircases without building an adjacent ADA-compliant ramp. I’ve worked on transpo projects where having a staircase w/o a ramp next to it would be considered violating ADA regulations on “integrated settings” but I don’t know if that applies to buildings and private developers. This is the solution when you have the ground floor raised a bit from the sidewalk level due to the existence of a grade on the street. If you don’t do that, you’d have to build storefronts with different heights, and that would require additional expenses to make the entrances ADA-compliant. From a more technical legalese POV, having a separate raised sidewalk for access to stores allow you to apply your own standards to prevent its use in a manner that you don’t want, as it is part of the private property, not the public sidewalk. Regulations are a bit murkier. If there is just one store or space inside, you could get away with building other parallel entrances with stairs only. But if you have different stores, pointing the end of the building and a big ramp loop for a wheelchair accessible way is unacceptable. How is the vacant rate for commercial spaces in the area? It is impossible to evaluate reasons for the places being empty without considering that. Mixed-used buildings are difficult to manage, in the sense that the owner probably doesn’t want retail that is below par compared to the targeted demographics for the residences. Since prices are pretty expensive (from what I got from the developers’ website) for the housing units, one could only expect the developer doesn’t want some fast-food joint or business that would lessen the perceived status of the property (which could reduce the rents it can charge). So we need to consider the market for commercial spaces on the price/sophistication range targeted by the developer. If the area has a glut of premium retail spaces, it will stay empty for a long time. Now, of course, the developer could lower the price until if finds a tenant. That is what usually happens with commercial-only properties: some rent is better than no rent. However, mixed-use buildings require a more delicate balancing act: on a extreme case, you don’t want a payday lender, a cheap nail saloon and a pawn shop taking the floor and being the first sight your renters – paying up to 7 thousand dollars per unit – will see every day (let alone potential renters). Thank you for the excellent post and analysis Alexander! I would love to see more stories like this on streetsblog. You can also read my other stories on Streetsblog (links are embedded onto my name, which is under the article title). Except that they don’t actually look wealthy! They look like fortresses of a particular vision of wealth.